Hi folks! I'm not a clan so I hope this kind "Recruitment" is allowed. I am a new Twitch Streamer hoping to gain a following Streaming games like Battlefront II and a few others. I am hoping to find some folks to play with that wouldn't mind being Broadcasted as we go. I play various modes but my favourites are HvV - GA - Extraction. 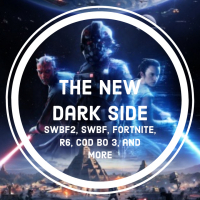 If this interests you please send me a friend request at ( Bizerry ) and I look forward to seeing you on the Battlefront! Hey! Just sent a message to you on PlayStation. Just wanted to see if I had the right guy. If it's not my PS name is Gavin0503 so we might be able to play some day. May the Force be with you always! Also I stream on YT so if that bothers you I don't have to while we are playing. See ya!